What why and how do I use them? Designed Ice opened In July 2017, by Duane Schmelhaus. Duane has been honing his craft for many years working with various master carvers from around the world. The lifetime of a sculpture is determined primarily by the temperature of its environment, thus a sculpture can last from mere minutes to possibly months. There are several ice festivals held around the world, hosting competitions of ice sculpture carving. Ice sculptures feature decoratively in some cuisines and may be used to enhance the presentation of foods, especially cold foods such as seafood or sorbets. The story of the creation of the dish Peach Melba recounts that Chef Auguste Escoffier used an ice swan to present the dish. At holiday buffets and Sunday brunches some large restaurants and hotels will use ice sculptures to decorate the buffet tables. Cruise ship buffets are also famous for their use of ice sculptures. Ice sculptures are often used at wedding receptions, usually as some form of decoration. Popular subjects for ice sculptures at weddings are hearts, doves, and swans. Swans have a reputation for monogamy, partly accounting for their popularity. Ice sculptures may be used at a bar, in the form of an ice luge, or even the entire bar may be made of ice. Ice sculptures with high surface area like in a radiator can be use to cool air to blow on people during heat wave events when air conditioning is not available. Here you can see a few of the different types of carvings available. These are pieces we have completed for other clients but don't let these examples limit your designed ice imagintation. These are designed to chill the liquid for your guest to enjoy. Not just for adults we have found they are awesome for children’s parties with lemonade and fruit punch, a big hit with the kids. We would love to incorporate your theme or event, help the chefs showcase the food. 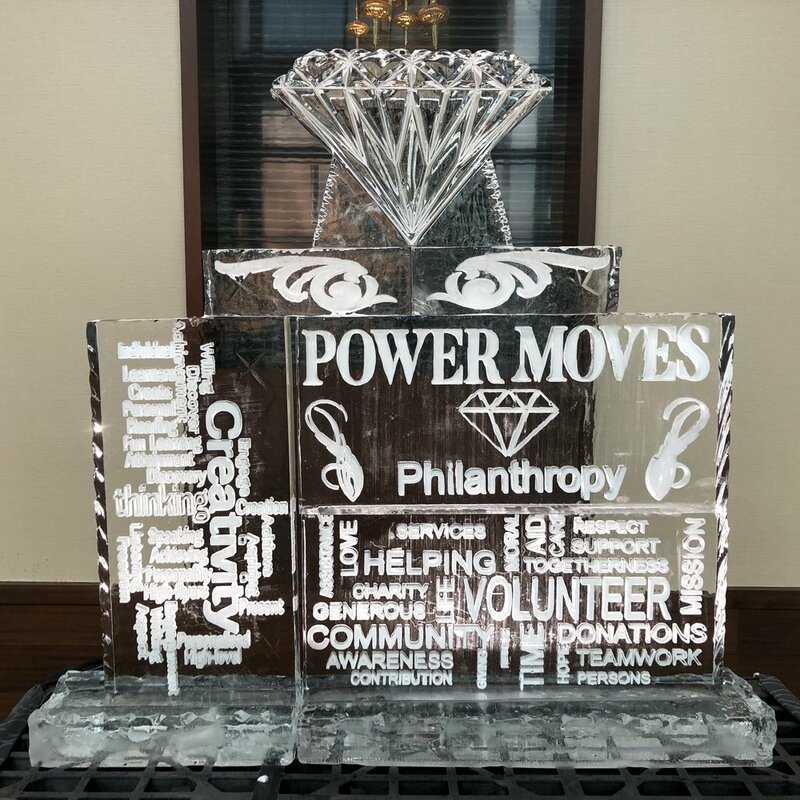 Enhance your event with a Designed Ice Sculpture to be at the center of your event. Or imaging a center piece on each table made of ice. Imagine the cool reaction from your guests. Do you have a logo, we can put it in Ice for any type of display you may need. Are you ready to have a Ice sculpture Designed for you? Canceled Carvings the week of the event will be charged 25% of the invoiced amount. Please note that any returned check will require a $50 returned check fee along with any fees acquired by Designed Ice from their financial institution. **Personal checks/cashiers checks/money orders are NOT accepted for payment. ***Delivery persons do not carry or accept cash for payments.